1995 – 1997: Postdoctoral fellow with Prof. Israel Wachs at Lehigh University (USA) and with Prof. Jack Lunsford at Texas A&M University (USA). The 2018 Robert B. Anderson Award. Organization: Canadian Catalysis Foundation. The 2017 Kozo Tanabe Prize for Acid-Base Catalysis. Organization: International Acid-Base Catalysis Group. The 2013 Spinoza Award. Organization: Netherlands Organization for Scientific Research (NWO). The 2013 John Bourke Award. Organization: Royal Society of Chemistry (RSC). The 2012 International Catalysis Award. Organization: International Association of Catalysis Societies (IACS). The 2011 Paul H. Emmett Award in Fundamental Catalysis. Organization: North American Catalysis Society (NACS). The 2009 Netherlands Catalysis and Chemistry Award. Organization: The Organization of Dutch Catalysis Industries (VIRAN) and the Catalysis Section of the Royal Dutch Chemical Society (KNCV). The 2009 CATSA Eminent Visitor Award. Organization: The Catalysis Society of South Africa (CATSA). The 2007 DECHEMA Award. Organization: The Max Buchner Research Foundation of the German Organization of Chemical Engineering and Biotechnology. The 2006 KNCV Gold Medal. Organization: Royal Dutch Chemical Society (KNCV). The 2017 Xing Da Lectureship. Organization: Peking University. The 2013 Vladimir N. Ipatieff Lectureship. Organization: Northwestern University. Fellow of the American Association for Advancement of Science (AAAS, 2015-onwards). Fellow of ChemPubSoc Europe (2015-onwards). Knight in the Order of the Dutch Lion (2015). Member of the Royal Flemish Academy of Belgium for Science and the Arts (KVAB, 2015-onwards). Member of the Royal Dutch Academy of Sciences (KNAW, 2011-onwards). Member of the European Academy of Science (Academia Europea, 2010-onwards). Member of the Royal Holland Society of Sciences (KHMW, 2010-onwards). Member of the Netherlands Academy of Technology and Innovation (AcTI, 2009-onwards). Fellow of the Royal Society of Chemistry (RSC, 2007-onwards). Alumnus member of the Young Academy (DJA) of the Royal Dutch Academy of Sciences (2005-2010). Gravitation grant (2013) for MCEC. Funding Agency: Netherlands Organization of Scientific Research. ERC Advanced Grant (2012). Funding Agency: European Research Council. TOP Research grant (2011). Funding Agency: Netherlands Organization of Scientific Research. TOP Research grant (2006). Funding Agency: Netherlands Organization of Scientific Research. VICI Grant (2002). Funding Agency: Netherlands Organization of Scientific Research. The 2004 EFCATS School Lecturer Award. Organization: The European Federation of Catalysis Societies (EFCATS). The 1998 KULeuven Research Council Award. Organization: Research Council of Leuven University. The 1994 Exxon-VJC Lecture Award. Organization: Royal Flemish Chemical Society (KVCV). The 1991 Water Research Award. Organization: vzw Water, Energie en Leefmilieu (WEL). Scientific director ARC-CBBC, Advanced Research Center Chemical Building Blocks Consortium, since 2016, of which he has been one of the main initiators. 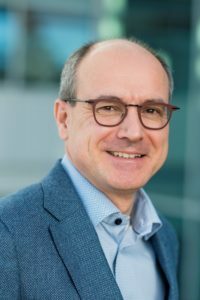 Scientific director of MCEC, the Netherlands Center for Multiscale Catalytic Energy Conversion, since 2014, of which he has been one of the main initiators. Scientific director of the Smartmix research program CATCHBIO on Biomass Catalysis funded by the Dutch government and chemical industries, 2006-2016, of which he has been one of the initiators. Scientific director of the Dutch Research School for Catalysis (NIOK), 2003-2013. Applied Catalysis A: General | Catalysis Letters | Catalysis Today | Chem | Chemical Society Reviews | Angewandte Chemie | ChemCatChem | ChemPhysChem | Faraday Discussions | Journal of Applied Chemistry | Journal of Nanoscience and Nanotechnology | PCCP | Topics in Catalysis | Vibrational Spectroscopy. ‘Chief Science Officer’ of Topteam of the Topsector Chemistry, since 2014 (before member Topteam Chemie, 2011-2014). Expert in panels for Ministry of Economic Affairs, Ministry of Education, Culture and Science and NWO (Netherlands Organisation for Scientific Research). Titular Member of the Physical and Biophysical Chemistry Division of the International Union of Pure and Applied Chemistry (IUPAC). Appointed as member of the Scientific Advisory Board of the Max Planck Institute for Chemical Energy Conversion (Germany), Cardiff Catalysis Institute (UK), Dalian Institute for Chemical Physics (China) and the Center for Catalysis and Surface Science of Northwestern University (USA). G.T. Whiting, N. Nikolopoulos, I. Nikolopoulos, A. Dutta Chowdhury, B.M. Weckhuysen, Visualizing pore architecture and molecular transport boundaries in catalytic bodies with fluorescent nanoprobes, Nature Chemistry 2018, doi: 10.1038/s41557-018-0163-z. F. Meirer, B.M. Weckhuysen, Spatial and temporal exploration of heterogeneous catalysts with synchrotron radiation, Nature Reviews Materials 2018, 3, 324. Schmidt, J E; Peng, L; Paioni, A L; Ehren, H L; Guo, W; Mazumder, B; Winter, Matthijs De D A; Attila, Ö; Fu, D; Chowdhury, A D; Houben, K; Baldus, M; Poplawsky, J D; Weckhuysen, B M, Isolating Clusters of Light Elements in Molecular Sieves with Atom Probe Tomography, Journal of the American Chemical Society 2018, 29, 140. I. Yarulina, A. Dutta Chowdhury, F. Meirer, B.M. Weckhuysen, J. Gascon, Recent trends and fundamental insights in the methanol-to-hydrocarbons process, Nature Catalysis 2018, 1, 398. I. Yarulina, K. De Wispelaere, S. Bailleul, J. Goetze, M. Radersma, E. Abou-Hamad, I. Vollmer, M. Goesten, B. Mezari, E.J.M. Hensen, J.S. Martinez-Espin, M. Morten, S. Mitchell, J. Perez-Ramirez, U. Olsbye, B.M. Weckhuysen, V. Van Speybroeck, F. Kapteijn, J. Gascon, Structure-performance descriptors and the role of Lewis acidity in the methanol-to-propylene process, Nature Chemistry 2018, 10, 804. C. Vogt, E. Groeneveld, G. Kamsma, M. Nachtegaal, L. Lu, C.J. Kiely, P.H. Berben, F. Meirer, B.M. Weckhuysen, Unraveling Structure Sensitivity in CO2 Hydrogenation over Nickel, Nature Catalysis, 2018, 1, 127. Fu, D; Schmidt, J E; Pletcher, P; Karakiliç, P; Ye, X; Vis, C M; Bruijnincx, P C A; Filez, M; Mandemaker, L D B; Winnubst, L; Weckhuysen, B M, Uniformly Oriented Zeolite ZSM-5 Membranes with Tunable Wettability on a Porous Ceramic, Angewandte Chemie – International Edition 2018, 38, 57. A. Dutta Chowdhury, K. Houben, G.T. Whiting, S.H. Chung, M. Baldus, B.M. Weckhuysen, Electrophilic Aromatic Substitution over Zeolites generates Wheland-type Reaction Intermediates, Nature Catalysis 2018, 1, 23. Filez, M; Poelman, H; Redekop, E A; Galvita, V V; Alexopoulos, K; Meledina, M; Ramachandran, R K; Dendooven, J; Detavernier, C; Tendeloo, Van G; Safonova, O V; Nachtegaal, M; Weckhuysen, B M; Marin, G B, Kinetics of Lifetime Changes in Bimetallic Nanocatalysts Revealed by Quick X-ray Absorption Spectroscopy, Angewandte Chemie – International Edition 2018, 38, 57.
van Ravenhorst, I K; Vogt, C; Oosterbeek, H; Bossers, K W; Moya-Cancino, J G; van Bavel, A P; van der Eerden, A M J; Vine, D; de Groot, F M F; Meirer, F; Weckhuysen, B M, Capturing the Genesis of an Active Fischer–Tropsch Synthesis Catalyst with Operando X-ray Nanospectroscopy, Angewandte Chemie – International Edition 2018, 37, 57. Schmidt, J E; Peng, L; Poplawsky, J D; Weckhuysen, B M, Nanoscale Chemical Imaging of Zeolites Using Atom Probe Tomography, Angewandte Chemie – International Edition 2018, 33, 57. J.E. Schmidt, R. Oord, W. Guo, J.D. Poplawsky, B.M. Weckhuysen, Nanoscale Tomography Reveals the Deactivation of Automotive Copper-exchanged Zeolite Catalysts, Nature Communications, 2017, 8, 1666. Hendriks, F C; Meirer, F; Kubarev, A V; Ristanović, Z; Roeffaers, M B J; Vogt, E T C; Bruijnincx, P C A; Weckhuysen, B M, Single-molecule fluorescence microscopy reveals local diffusion coefficients in the pore network of an individual catalyst particle, Journal of the American Chemical Society 2017, 39, 139. Y. Liu, F. Meirer, C.M. Krest, S. Webb, B.M. Weckhuysen, Relating Structure and Composition with Accessibility of a Single Catalyst Particle using Correlative 3-dimensional Micro-spectroscopy, Nature Communications, 2016, 7, 12634. Ristanović, Z; Kubarev, A V; Hofkens, J; Roeffaers, M B J; Weckhuysen, B M, Single Molecule Nanospectroscopy Visualizes Proton-Transfer Processes within a Zeolite Crystal, Journal of the American Chemical Society, 2016, 41, 138. Gu, D; Tseng, J -C; Weidenthaler, C; Bongard, H -J; Spliethoff, B; Schmidt, W; Soulimani, F; Weckhuysen, B M; Schüth, F, Gold on Different Manganese Oxides: Ultra-Low-Temperature CO Oxidation over Colloidal Gold Supported on Bulk-MnO2 Nanomaterials, Journal of the American Chemical Society 2016, 30, 138. D.E. Perea, I. Arslan, J. Liu, Z. Ristanovic, L. Kovarik, B.W. Arey, J.A. Lercher, S.R. Bare and B.M. Weckhuysen, Determining the Location and Nearest Neighbors of Aluminum in Zeolites with Atom Probe Tomography, Nature Communications 2015, 6, 7589. F. Meirer, S. Kalirai, D. Morris, S. Soparawalla, Y. Liu, G. Mesu, J.C. Andrews, B.M. Weckhuysen, Life and Death of a Single Catalytic Cracking Particle, Science Advances 2015, 1, e1400199. W. Luo, M. Sankar, A.M. Beale, Q. He, C.J. Kiely, P.C.A. Bruijnincx, B.M. Weckhuysen, Highly Active, Selective and Stable Supported Nano-alloys for the Hydrogenation of Levulinic Acid to Gamma-valerolactone, Nature Communications 2015, 6, 6540. Sattler, J J H B; Ruiz-Martinez, J; Santillan-Jimenez, E; Weckhuysen, B M, Catalytic dehydrogenation of light alkanes on metals and metal oxides, Chemical Reviews 2014, 20, 114. Bij, Van Der H E; Cicmil, D; Wang, J; Meirer, F; Groot, De F M F; Weckhuysen, B M, Aluminum-phosphate binder formation in zeolites as probed with X-ray absorption microscopy, Journal of the American Chemical Society 2014, 51, 136. I.L.C. Buurmans, B.M. Weckhuysen, Heterogeneities of Individual Catalyst Particles in Space and Time as Monitored by Spectroscopy, Nature Chemistry 2012, 4, 873. E.M. van Schrojenstein Lantman, T. Deckert-Gaudig, A.J.G. Mank, V. Deckert, B.M. Weckhuysen, Catalytic Processes Monitored at the Nanoscale with Tip-enhanced Raman Spectroscopy, Nature Nanotechnology 2012, 7, 583. I.L.C. Buurmans, J. Ruiz-Martinez, W.V. Knowles, D. van der Beek, J.A. Bergwerff, E.T.C. Vogt, B.M. Weckhuysen, Catalytic Activity in Individual Cracking Catalyst Particles Imaged Throughout Different Life Stages by Selective Staining, Nature Chemistry 2011, 3, 862. Zakzeski, J; Bruijnincx, P C A; Jongerius, A L; Weckhuysen, B M, The catalytic valorization of lignin for the production of renewable chemicals, Chemical Reviews 2010, 6, 110. L. Karwacki, M.H.F. Kox, D.A.M. de Winter, M.R. Drury, J.D. Meeldijk, E. Stavitski, W. Schmidt, M. Mertens, P. Cubillas, N. John, A. Chan, N. Kahn, S.R. Bare, M. Anderson, J. Kornatowski, B.M. Weckhuysen, Morphology-dependent Zeolite Intergrowth Structures leading to Distinct Internal and Outer-surface Molecular Diffusion Barriers, Nature Materials 2009, 8, 959. Weckhuysen, B M, Heterogeneous catalysis: Catch me if you can! Nature Chemistry 2009, 9, 1. Smit, De E; Weckhuysen, B M, The renaissance of iron-based Fischer-Tropsch synthesis: On the multifaceted catalyst deactivation behaviour, Chemical Society Reviews 2008, 12, 37. E. de Smit, I. Swart, J.F. Creemer, G.H. Hoveling, M.K. Gilles, T. Tylisczak, P.J. Kooyman, H.W. Zandbergen, C. Morin, B.M. Weckhuysen, F.M.F. de Groot, Nanoscale Chemical Imaging of a Working Catalyst by Scanning Transmission X-ray Microscopy. Nature 2008, 456, 222. Weckhuysen, B M; Wachs, I E; Schoonheydt, R A, Surface chemistry and spectroscopy of chromium in inorganic oxides, Chemical Reviews 1996, 8, 96. B.M. Weckhuysen, P. Van Der Voort, G. Catana (Editors). Spectroscopy of transition metal ions on surfaces. Leuven University Press, Leuven, 2000, 332 pages. ISBN 90-586-7025-2. B.M. Weckhuysen (Editor). In situ Spectroscopy of Catalysts. American Scientific Publishers, San Diego, 2004, 332 pages. ISBN 1-58883-026-8. M.A.R. Meier, B.M. Weckhuysen, P.C.A. Bruijnincx (Editors). Organometallics and Renewables, Springer-Verlag Berlin Heidelberg, Topics in Organometallic Chemistry Vol. 39, 2012, 228 pages. ISBN 978-3-642-28287-4 (print) and 978-3-642-28288-1 (online). B.M. Weckhuysen, P. Van Der Voort, G. Catana. Spectroscopic characterization of heterogeneous catalysts, in Spectroscopy of transition metal ions on surfaces, Weckhuysen, B.M. ; Van Der Voort, P.; Catana, G. (Eds), Leuven University Press, Leuven, 2000, p. 13. B.M. Weckhuysen, R.A. Schoonheydt. General principles of electron spin resonance, in Spectroscopy of transition metal ions on surfaces, Weckhuysen, B.M. ; Van Der Voort, P.; Catana, G. (Eds), Leuven University Press, Leuven, 2000, p. 25. B.M. Weckhuysen, R.A. Schoonheydt (2000). General principles of vibrational spectroscopies, in Spectroscopy of transition metal ions on surfaces, Weckhuysen, B.M. ; Van Der Voort, P.; Catana, G. (Eds), Leuven University Press, Leuven, 2000, p. 157. B.M. Weckhuysen, R.A. Schoonheydt (2000). Diffuse reflectance spectroscopy, in Spectroscopy of transition metal ions on surfaces, Weckhuysen, B.M. ; Van Der Voort, P.; Catana, G. (Eds), Leuven University Press, Leuven, 2000, p. 221. B.M. Weckhuysen, I.E. Wachs. Catalysis by supported metal oxides, in Handbook of Surfaces and Interfaces of Materials, Nalwa, H.S. (Ed. ), Academic Press, San Diego, 2001, p. 613. B.M. Weckhuysen, R. Heidler, R.A. Schoonheydt (2004). Electron Spin Resonance Spectroscopy, in Molecular Sieves – Science and Technology (Vol. 4: Characterization I), Karge, H.G., Weitkamp, J. (Eds. ), Springer Verlag, Berlin, p. 295. B.M. Weckhuysen (2004). In-situ spectroscopy of catalysts, in In situ Spectroscopy of Catalysts, Weckhuysen, B.M. (Ed. ), American Scientific Publishers, San Diego, p. 1. B.M. Weckhuysen (2004). Ultraviolet-Visible spectroscopy, in In situ Characterization of Catalysts, Weckhuysen, B.M. (Ed. ), American Scientific Publishers, San Diego, p. 255. F. Morales, B.M. Weckhuysen (2006). Promotion effects in Co-based Fischer-Tropsch catalysis, in Catalysis, Vol. 19, Spivey, J.J. (Ed. ), Royal Society of Chemistry, Cambridge, p. 1. J.A. Bergwerff, B.M. Weckhuysen (2008). Active phase-support interactions: oxide-support interactions. In Handbook of Heterogeneous Catalysis, 2nd Ed., Wiley-VCH, Weinheim, Ertl, G.; Knozinger, H.; Schuth, F.; Weitkamp, J. (Eds. ), p. 1188. A. Ruppert, B.M. Weckhuysen (2008). Active phase-support interactions: metal-support interactions. In Handbook of Heterogeneous Catalysis, 2nd Ed., Wiley-VCH, Weinheim, Ertl, G.; Knozinger, H.; Schuth, F.; Weitkamp, J. (Eds. ), p. 1178. T.A. Nijhuis, E. Sacaliuc, B.M. Weckhuysen (2008). The epoxidation of propene over gold nanoparticle catalysts in Mechanisms in Homogeneous and Heterogeneous Epoxidation Catalysis, Elsevier, Amsterdam, Oyama, S.T. (Ed. ), p. 340. B.M. Weckhuysen (2009), Space and time resolved spectroscopy of catalyst bodies, in Synthesis of Solid Catalysts, Wiley-VCH, Weinheim, de Jong, K.P. (Ed. ), p. 201. M.H.F. Kox, B.M. Weckhuysen (2010), Spatial heterogeneities within an individual catalyst particle during reaction as revealed by in-situ micro-spectroscopy, in On Catalysis, Edition Ostwald, 2nd Ed., Wissenschaft und Bilduing, Berlin, Reschetilowski, W., Houle, W. (Eds. ), p. 240. E. Stavitski, B.M. Weckhuysen (2010), Vibrational spectroscopy and related in-situ studies of catalytic reactions with molecular sieves, in Zeolites and Catalysis: Synthesis, Reactions and Applications, Wiley-VCH, Weinheim, Cejka, J.; Corma, A.; Zones, S. (Eds. ), p. 209. E. Stavitski, A.M. Beale, B.M. Weckhuysen (2011), Catalysts Characterization: Heterogeneous, in Encyclopedia of Catalysis, 2nd Ed., Wiley-VCH, Weinheim, Horvath, I. (Ed. ), p. 5. P.C.A. Bruijnincx, R. Jastrebski, P.J.C. Hausoul, R.J.M. Klein Gebbink, B.M. Weckhuysen (2012), Pd—catalyzed telomerization of 1,3-dienes with multifunctional renewable substrates: Versatile routes for the valorization of biomass-derived platform molecules, in Organometallics and Renewables, Springer, Heidelberg, M.A.R Meier, B.M. Weckhuysen, P.C.A. Bruijnincx (Eds. ), p. 45. B. Weckhuysen (2012), In-situ characterization of heterogeneous catalysts, in Catalysis, From Principles to Applications, Wiley-VCH, Weinheim, Beller, M.; Renken, A. van Santen, R.A. (Eds. ), p. 493. A.M. Beale, M.G. O’Brien, B.M. Weckhuysen (2012), Techniques coupling for catalyst characterization, in Characterization of Solid Materials and Heterogeneous Catalysts: From Structure to Surface Reactivity, Vol. 2, Wiley-VCH, Weinheim, Che, M.; Vedrine, J.C. (Eds. ), p. 1077. A.M. Beale, J. Ruiz-Martinez, B.M. Weckhuysen (2013), Catalyst imaging using synchrotron-based multitechnique approaches, in In-Situ Characterization of Heterogeneous Catalysts, Wiley, Hoboken, J.A. Rodrigez, J.C. Hanson, P.J. Chupas (Eds. ), p. 441. A.M. Beale, J.P. Hofmann, M. Sankar, E.M. van Schrojenstein Lantman, B.M. Weckhuysen (2014), Recent trends in operando and in-situ characterization techniques for rational design of catalysts, in Handbook of Heterogeneous Catalysts, Wiley, VCH, Weinheim, Wilson, K., Lee, A. (Eds. ), p. 365. E.T.C. Vogt, G.T. Whiting, A. Dutta Chowdhurry, B.M. Weckhuysen, Zeolites and zeotypes for oil and gas conversion, in Advances in Catalysis, Vol. 58, Academic Press, New York, F.C. Jentoft (Ed. ), 2015, p. 143. S.C.C. Wiedemann, P.C.A. Bruijnincx, B.M. Weckhuysen, Isostearic Acid: A unique fatty acid with great potential, in Chemicals and Fuels from Bio-Based Building Blocks, First Edition, Wiley-VCH, Weinheim, F. Cavani, S. Albonetti, F. Basile, A. Gandini (Eds. ), 2016, p. 51. R. Oord, B.M. Weckhuysen, Cu-Zeolite Selective catalytic reduction catalysts for NOx conversion, in Zeolites and Zeolite-Like Materials, Elsevier, Amsterdam, B. Sels, L. Kustov (Eds. ), 2016, p. 433. J.E. Schmidt, G.T. Whiting, A. Dutta Chowhdurry, B. Seoane, B.M. Weckhuysen, Spectroscopy of Zeolites, in Zeolites in Catalysis: Properties and Applications, Royal Society of Chemistry, Cambridge, J. Cejka, R.E. Morris, P. Nachtigall (Eds. ), 2017, p. 240. C.S. Lancefield, B.M. Weckhuysen, P.C.A. Bruijnincx, Catalytic Conversion of Lignin-derived Aromatic Compounds into Chemicals, in Lignin Valorization: Emerging Approaches, G.T. Beckham (Ed. ), Royal Society of Chemistry, Cambridge, G.T. Beckham (Ed. ), 2018, p. 159. United States Patent 9,956,547 (2018). Preparation of polyglycerols. Inventors: A. Kaiser, B.M. Weckhuysen, D. Leinweber, F. Kirby, F.X. Scherl, H.J. Metz & P.C.A. Bruijnincx. United States Patent 9,095,844 (2015). Catalyst for Glycerol Aqueous Phase Reforming and Preparation Thereof. Inventors: Y.M. Chung, T. J. Kim, S.H. Oh, D. Ayse Boga, P.C.A. Bruijnincx & B.M. Weckhuysen. United States Patent 8,370,082 (2013) & European Patent 2 142 908 B1 (2010). Method for predicting a physical property of a residue obtainable from a crude oil. Inventors: P. de Peinder, F.A.J. Singelenberg, T. Visser & B.M. Weckhuysen. United States Patent 7,476,374 (2009). Catalytic destruction of halogenated hydrocarbons. Inventors: B. Weckhuysen, R. Schoonheydt & P. Van der Avert. United States Patent Application 2017/0266651 A1 (2017). Process for the manufacture of alcohol and/or ketone. Inventors: S. Chouzier, L.F. Rascon Cruz, B.M. Weckhuysen & S. Mastroianni. Patent Cooperation Treaty International Patent Application WO 2015/026234 A1 (2015). Supported monometallic and bimetallic catalysts for the hydrogenation of levulinic acid. Inventors: W. Luo, M. Sankar, P.C.A. Bruijnincx, B.M. Weckhuysen. Patent Cooperation Treaty International Patent Application WO 2012/177138 A1 (2012). Process for the liquid-phase reforming of lignin to aromatic chemicals and hydrogen. Inventors: J. Zakzeski, P.C.A. Bruijnincx & B.M. Weckhuysen. European Patent Application EP 2014362 A1 (2009). Metathesis of chlorinated waste compounds. Inventors: A.W.A.M. van der Heijden, J.H. Bitter & B.M. Weckhuysen. European Patent Application EP 1961726 A1 (2008). Process for the conversion of glycerol and catalytically active material suitable thereof. Inventors: A.M. Ruppert & B.M. Weckhuysen. Patent Cooperation Treaty International Patent Application WO 2005/082815 A1 (2005) & European Patent Application EP 1564198 A1 (2005). Heterogeneous chromium catalysts. Inventors: C. Nenu, P. Bodart & B.M. Weckhuysen. Chemical Engineering Science, 198 , pp. 305-316, 2019. Angewandte Chemie - International Edition, 58 (12), pp. 3908-3912, 2019. ChemCatChem, 11 (1), pp. 417-423, 2019. Applied Catalysis A: General, 564 , pp. 113-122, 2018. Angewandte Chemie - International Edition, 57 (33), pp. 10422-10435, 2018. Catalysis Letters, 148 (8), pp. 2459-2471, 2018. Nature Chemistry, 10 (8), pp. 804-812, 2018. Journal of the American Chemical Society, 140 (29), pp. 9154-9158, 2018. Proceedings of the National Academy of Sciences of the United States of America, 115 (30), pp. 7676-7681, 2018. Angewandte Chemie - International Edition, 57 (27), pp. 8095-8099, 2018. Journal of Catalysis, 363 , pp. 128-135, 2018. Advanced Materials, 30 (26), 2018. Chemistry - A European Journal, 24 (18), pp. 4597-4606, 2018. Chemistry - A European Journal, 24 (15), pp. 3733-3741, 2018. ACS Catalysis, 8 (3), pp. 2060-2070, 2018. ACS Catalysis, 8 (3), pp. 2397-2401, 2018. IUCrJ, 5 , pp. 190-199, 2018. ChemPhysChem, 19 (4), pp. 367-372, 2018. ChemPhysChem, 19 (4), pp. 379-385, 2018. Applied Catalysis A: General, 551 , pp. 13-22, 2018. Nanoscale, 10 (4), pp. 1815-1824, 2018. Macromolecules, 51 (2), pp. 343-355, 2018. Applied Catalysis A: General, 549 , pp. 197-206, 2018. Catalysis Science and Technology, 8 (6), pp. 1632-1644, 2018. Catalysis Science and Technology, 8 (4), pp. 1028-1038, 2018.